It has become a tradition that, on the first Sunday of September, cannons boom, rifles fire and an attacking cavalry pierces a powdery smoke shrouding a river in the Borodino field. The story repeats itself every year. peddler seducing a girl, and a young leader and the October revolution poured out in halls. We have not grasped how these extraordinary war history clubs emerged. It is known, however, that they appeared independently, a so-called initiative of the masses. Young and mature people suddenly began reading historical books and studying history, wearing costumes of that time, riding and playing battles. It would be natural if they made a film. However, they do not make a show, but they enjoy it. They cannot be called mummers. Merrymaking is something temporary, while they are characterised by enviable permanency. Speaking about war history clubs, we should admit that they originate from Europe. Small states have always appreciated and maintained their history, trying to arouse interest in it. Even the smallest town on Earth left a page in history. Unfortunately, wars are remembered most. Every town underwent invasions and sieges, fighting until the last defender died. Thus, anniversaries of such towns revived pages of history, the first being military ones. At first, it was only performances played by actors, then they were joined by doubles. The latter in their turn were gradually replaced by members of war history clubs, who realised that they should not rely blindly on scripts, but know all the details of what had happened. And they succeeded. Spreading from small towns to former theatres of wars, 'battles' acquired an enormous scale. The interest in them also increased. The last 'battle' of Waterloo attracted more than 200,000 spectators, which is hard to imagine! They paid 50 dollars for a ticket. What a profit! This is, however, not all. Tourists from all parts of the world came to see the 'battle'. Hotels and private houses were full of people. Near the battlefield, tents were installed for young visitors who required no comfort. A huge amount of sandwiches, beer and souvenirs! Tin and plastic soldiers were in great demand. Everybody could have a picture taken with ... Napoleon – about two dozen of whom were wandering among guests. Pragmatic capitalists foresaw everything. A grandiose war show would pay its way. 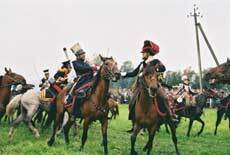 What battle of Waterloo could it be without Russians? Having invited our clubs, organisers generously paid their tickets and full board and lodging. A special anniversary organising centre was established in Waterloo. Our museum in Borodino is still begging for money, while the government cannot agree with almost ruined collective farms upon the lease of land. They have already been negotiating for a long time. Collective farms seek a small profit, whereas they could get thousands of dollars through hard work. Kopecks are easily earned by scandals, and the collective farms are content with them. 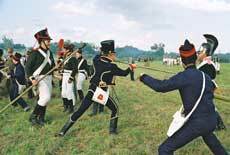 War historians once pictured a profile officer, participating in the Battle of Borodino. He appeared to be 31 years old, single, serving for more than a decade, a participant in four battles, knowing two European languages, with poor reading and writing skills. The latter, however, is only an assumption, which is not very important for history. Therefore, today's uhlans and grenadiers can ignore it. It is not a problem if you visit the anniversaries of the Battle of Borodino without any knowledge of the classification of regiments and divisions. Army life was not only comprised of service. Do you know whether a soldier could get married? You may also be interested in details of their everyday life. For example, what did a soldier use lor shaving during a campaign? Could he receive letters from home and reply to them that he was safe and sound? No ideas? Then, ask these questions to any member of a war history clubs and you will be answered. 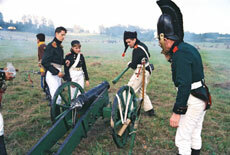 You may also ask whether a cruel attitude of officers towards young soldiers was typical for the army of Kutuzov. You will be told that every young soldier was patronised by a senior one, who was responsible for him and trained him until the oath-taking. Do our young officers know this? They hardly do, although they realise that everything is important in history. War history associations have a wonderful motto “By the ways of war to peace”. 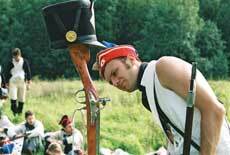 As a rule, every club chooses a regiment glorifying its flags in the Baltic of Borodino and begins scrutinising it. At first, they study its attributes. It should be mentioned that each regiment in the Russian army had its distinguishing features. 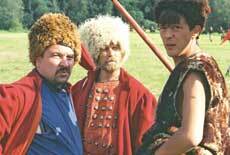 Then, they make the uniform, trying to find cloth similar to that used for the uniform of Kutuzov's soldiers. There are even specialists stamping any decorations and medals, and gunsmiths producing rifles not inferior to those in museums. Clubs have established their regulations and a strict discipline. 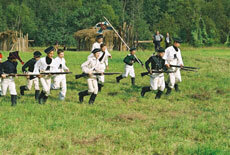 The schedule includes the studying of weapons and marching drills. Everything is voluntary – you may come and go as you please. In the evenings, campfires are set and broth, similar to that eaten by soldiers before the battle, is boiling in kettles. It is time to talk. “Colonel Constantine Panin”, a 40-year old man introduced himself, “the Novgorod Cuirassier Regiment”. The warmth of the night was diluted by a milky fog, and we were sitting, adding sticks to the fire and talking. Constantine Panin and his cuirassiers visited Waterloo and Austerlitz. What a wonderful performance! Thousands of soldiers participated in battles, which spread over a huge area. Performers must be doubles, rather than just skilled soldiers. 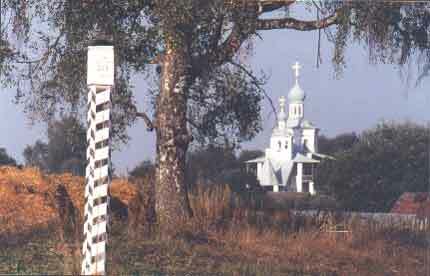 Constantine is glad that anniversaries of the Battle of Borodino have become brighter. A decade ago, only 100 or 200 of enthusiasts came to the field. Today, there are 2,000 of them. A soldier's medal for the Battle of Borodino or the participation in a foreign campaign is not a rarity in the depositories of regional museums. 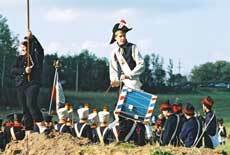 Thousands of soldiers from the whole of Russia withstood the army of Napoleon and were awarded for their deeds. At that time, the state was concerned about patriotism. Therefore, people who carefully thought over how to retain the glory of Russian soldiers deserve to be admired. For instance, medals were awarded to defenders of the Motherland and to people donating their estates. Nobleman's medals of 1812, just like merchant's ones, were passed from generation to generation through elder sons. Recently, in an antique shop, I saw a finger cross of a priest, a rare award for the batties of 1812. Probably, the person who sold it did not even know that the cross was ancestral. Under tough conditions or through ignorance, he changed the glory of his ancestors for money.